The steep and prolonged increase in the price of vegetables across India has imposed severe hardship on the average citizen. Official statistics places wholesale vegetable price inflation in October at 78 per cent compared to a year ago. The price rise was exemplified in particular by onions, a staple for most Indians, costing over Rs 80/kg in many parts of the country recently. The price of other vegetables of common consumption such as tomatoes and potatoes has also shot up. A catchall explanation that one often hears from the Government and its economists is that "demand is exceeding supply". 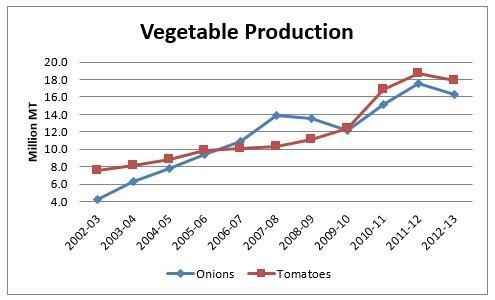 The accompanying chart shows data put out by the National Horticulture Board on the production of onions and tomatoes over the last decade. Besides tomato and onion, potato is among the top three vegetables produced in India. These three account for nearly half of the total vegetable production. Potato production increased from about 23 million MT in 2002-03 to 45 million MT in 2012-13. The corresponding figures for overall vegetable production are 85 million MT and 160 million MT. Per capita figures provide better insight as they account for population growth. In per capita terms, annual production of onion nearly quadrupled over the decade from 4.1 kg to 13.5 kg, that of tomato doubled from 7.4 kg to 14.8 kg while potato production increased from 22.5 kg to 37 kg. In the case of onion, there appears to be enough to allow exports. On average, over 10 per cent of onion production - 1.7 million MT - has been exported annually over the last five years. From these figures, it appears safe to conclude that at least for these vegetables of mass consumption, production is keeping pace with demand in the long term. At least part of the problem stems from the ground reality of the credit linkages that bind the different elements in the existing supply chain  not only the farmer to the commission agent and the wholesale trader to the commission agent, but also the small retailer to the mashakhor, and so on. A more pointed explanation for onion prices came from the Agriculture Minister, Sharad Pawar. Heavy rains had affected the onion crop in Maharashtra and Karnataka and this had temporarily affected supply. However, as crop area was higher, there would be no overall drop in production and prices would come down in a few weeks. Pawar also remarked that "when farmers were getting more money for their produce, we should not complain" implying that farmers were the beneficiaries (Economic Times, 19 September, 2013). Undoubtedly, weather events such as the one alluded to by the Minister can lead to some loss of production. However the question is, are these reasons for the price rise or just an excuse for it? 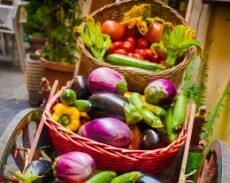 Horticultural produce typically traverses through at least two mandis (wholesale agricultural markets) in its journey from the farm to the urban consumer . an assembling mandi in the farming region and a terminal mandi near the urban consumption center. Farmers may take their produce directly to an assembling mandi . such as Lasalgaon in the onion growing region of Nasik . but often need to go through village agents who consolidate produce from several farmers, transport it to the mandi and arrange for its sale to a wholesale trader. This trader will in turn sell the produce to another wholesale trader at a terminal mandi . such as Azadpur sabji mandi in Delhi. The trader at the terminal mandi may directly sell the produce to large retailers; however sale to small retailers is typically mediated by sub-wholesalers (called mashakhors in Delhi). All transactions between farmer and trader or between two traders at the mandis are necessarily mediated by .commission agents. who match buyer and seller and charge a percentage of the transaction as commission. This supply chain architecture is actually mandated by Law. The prototype of the law was a colonial legislation establishing state control over wholesale agricultural markets, allowing the state to levy a transaction tax and giving it the ability to commandeer produce when needed. Agriculture is the responsibility of the state governments and most states have slightly differing versions of this law. The law dictates that farmers can sell their produce only in the state - established mandis to licensed middlemen (commission agents and wholesale traders). It also forces produce from outside state boundaries to be routed through local mandis ensuring yet another layer of middlemen between the farmer and the local retailer. Every player in the supply chain adds to the cost to the consumer. So besides the legitimate grading, packaging, labour and transport costs, there are the marketing fees (a transaction tax accruing to the government) paid at each mandi the produce traverses, as well as the commissions of the agents and the margins of the wholesalers. All this makes for the customer paying a price several times the price obtained by the farmer. A vegetable like onion that can be stored throws up another aspect of this supply chain. The winter rabi crop harvested in April-May, accounts for 60 per cent of onion production. Part of the crop must be stored to last the lean months, typically September to January, till kharif harvests arrive. Onion growers, mostly small farmers do not have the capacity to store; storage capacity lies mostly with the large traders in the supply chain. Traders build up their stocks from the rabi crop and then release them at higher prices in the retail market in the lean months when demand is inelastic because of major festivals and the marriage season. This appears to be the normal seasonal cycle in the onion market. What happens then when mandi middlemen anticipate a shortfall in production? The natural response is hoarding and tightening of supplies all along the chain. The consequent price spike is typically followed by a price collapse coinciding with the next harvest. By then, the traders have already made a killing while the farmers stare at ruin. An episode from a few years back illustrates this pattern. 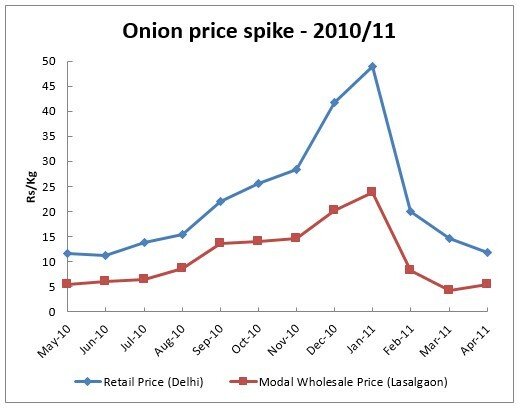 Onion prices climbed steeply in the months of December 2010 and January 2011 before collapsing as suddenly, as seen in the graphic below. The sharply higher retail margins during the spike point to hoarding in the terminal markets. The trigger for this episode was untimely rain which was expected to affect the late kharif crop in Karnataka, Gujarat and Maharashtra. As it turned out, onion production that year reached 15.1 million MT, the highest annual crop seen till then! Exports too at 1.3 million MT were lower that year compared to preceding and subsequent years. It appears that this is the pattern Sharad Pawar had in mind when he spoke about the current onion crisis and predicted that price would come back to normal in a few weeks. During the next year (May 2011 to April 2012), average wholesale prices at Lasalgaon, the largest onion procuring mandi in India remained in the range of Rs 3.90/kg - Rs 11/kg. There were reports of onion farmers in the Nasik area attempting suicide as they could not get even Rs 2/kg. This gives a lie to claims that farmers benefit from price spikes. The Competition Commission of India commissioned a study of onion markets by The Institute for Social and Economic Change, Bangalore, after this episode. The study focused on the onion supply chain from the main assembling markets of Karnataka and Maharashtra (which together account for over 50% of onion production in the country) to the consumption markets in the main metros. Analyzing price and market arrival data of onions across assembling and large metro mandis, the study found patterns that clearly pointed to hoarding and price fixing in onion markets. Other findings of the study throw light on why these practices thrive. The APMCs governing the mandis were largely dominated by traders. Commission agents and traders at the assembling mandis were well entrenched and formed an oligopoly, having been in the business on average for 20 years. The APMC officials . public servants - did not enforce market rules. Even transaction records, the key to understanding pricing, were not transparent. Many farmers were indebted to commission agents to whom they went for their credit requirements. Commission agents also extended short term credit to traders purchasing from them. The big traders in the assembling mandis were well connected with the intermediaries in other markets. Given all of the above, it is hardly surprising that the licensed intermediaries of the mandis can dictate prices to both the farmer and consumer. The government, of course, is well aware of what ails this supply chain. The Minister of State for Agriculture, Tariq Anwar was all candour recently: "If farmers get paid Rs 10 per kg, while the consumers pay anywhere between Rs 80-100 per kg of onion, there is obviously something seriously wrong in the way the onion market operates... we know that there are governance issues related to licensing of wholesalers, issues related to holding capacity of farmers, issues related to market prices information and a number of issues related to the whole supply chain which creates the kind of pricing contradiction." (PTI, Nov 8, 2013). A committee of bureaucrats looking into food inflation too did not mince words: "APMCs were established to protect the interest of farmers. However, in reality, the APMC system has abetted monopolistic behavior and reduced the choices available to small farmers ... Unwittingly, it is our well intentioned APMC law that has contributed to cartelization and collusion amongst incumbent traders." But then, what is the Government doing about it? Direct intervention in the market is no longer fashionable. The strategy revolves around encouraging large corporations to enter agricultural retail under the premise that these would build alternative supply chains in competition with existing ones. The moves to attract foreign direct investment into retail are part of this strategy. In line with this, the Union Government came up with a model APMC Act in 2003, providing for establishment of private markets and permitting direct sale of produce from contract farms to sponsors. Cropmarket.in tracks prices for more than 300 commodities traded at mandis across India. Leaving aside the fact that many states have not even adopted the model APMC Act after 10 years, even where it has been adopted, entrenched interests have prevented new markets from coming up and new trading licenses being granted in existing markets. Reports suggest that the grip of the established traders and agents is so strong that even corporate retailers who have been in business for a number of years have difficulty buying from farmers directly and have to pick up a majority of the produce they sell from the wholesale mandis (The Hindu Business Line, 25 Nov 2011). At least part of the problem stems from the ground reality of the credit linkages that bind the different elements in the existing supply chain - not only the farmer to the commission agent and the wholesale trader to the commission agent, but also the small retailer to the mashakhor and so on. The experience of Indian retailers punctures a big hole in the argument that allowing FDI in retail will automatically bring improvements in the supply chain. Radically transforming the supply chain for fruits and vegetables can bring huge benefits in price and price stability for the farmer and consumer, allow reliable price signals to the farmer and ensure better availability for the consumer. But the major political parties in government have no inclination to confront the powerful middlemen who control the agricultural markets, a confrontation necessary for any such transformation.